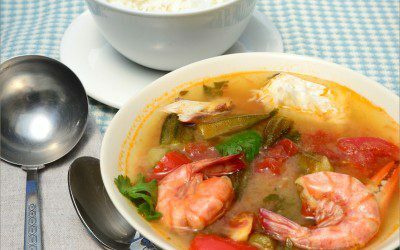 In a large pot, bring 1 1/2 quarts water to a boil and add crabmeat, shrimp, bay leaves, lemon wedges, onion slices, 1 teaspoon cayenne pepper, and black pepper. Boil for 10 minutes. Remove shrimp and crabmeat and set in refrigerator. Strain stock and set aside. Sauté sliced okra in 1 tablespoon of the vegetable oil in a large skillet. When soft and lightly browned, place in a large pot. Add chopped tomatoes to okra and cook over low heat, stirring often. In skillet with 1 tablespoon of the vegetable oil sauté green peppers and onion until tender. Add to okra and tomatoes and cook, stirring often. In the skillet, add 2 tablespoons flour and stir until slightly browned (if it burns, discard flour and start over again). Add remaining 2 tablespoons of vegetable oil to the flour and stir until mixture is slightly bubbly. Stir in 1 cup of the reserved stock and cook until thickened. Add this liquid to pot with vegetables. Stir thoroughly, keeping heat on low. Add additional stock to create a thick, stewlike consistency. Stir in thyme and 1/2 teaspoon cayenne pepper. Cover and cook over low heat for an additional two hours. Add reserved crabmeat and shrimp to gumbo and blend, adding additional stock if needed. Cover and continue to heat for another 30 minutes. Prepare rice. To serve, place 1/2 cup boiled white rice in a large soup bowl and top with 1 cup gumbo. Serve immediately. Serving size: 1 cup gumbo with 1/2 cup rice. Exchanges per serving: 1 starch, 2 vegetables, 1 medium-fat meat, 1 fat. Carbohydrate choices: 2.